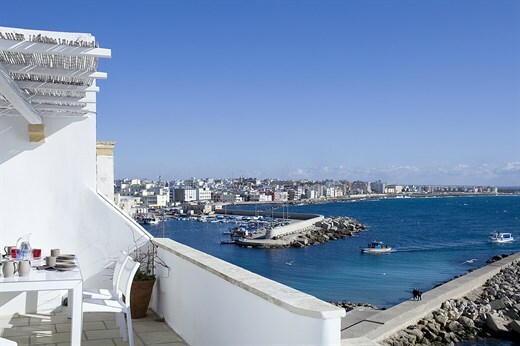 The ultimate panoramic sea-front apartment in the old town centre of gorgeous Gallipoli! Arriving at beautifully refurbished Scale Nove, your eyes will be glued to the beautiful surroundings: the picture perfect baroque buildings of Gallipoli, the beach, the sparkling sea, the boats bobbing in the marina... Such sights will accompany your whole stay, because Scale Nove does views like few other apartments we've ever seen! Inside: Scale Nove is situated on the first floor (and roof!) of a seafront house. Private stairs lead from street level up to the apartment's entrance and into a large open-plan living area with enormously high vaulted ceilings and mesmerising views out to sea. The smooth grey floor and softly coloured walls of this room are continued throughout the apartment, creating a calm, relaxing atmosphere. A couple of doors lead off one side of the living-dining room: one accesses the large, super-modern steel and marble kitchen (with fabulous sea views), the other accesses a double bedroom with en-suite shower room. On the other side of the living area, a corridor leads to a sea-view double-twin bedroom with bathroom with tub and rainfall shower opposite, stairs leading to a mezzanine study with sofa bed, a shower room, and a double bedroom with more fabulous sea views and a private flight of stairs accessing the terrace above! The terrace may also be accessed from the same private staircase that brought you up to the apartment's entrance. There is no other apartment of this kind available for rent in Gallipoli! From 25th April to 30th September cars are not allowed to enter the historical centre of Gallipoli. From 1st October to 24th April parking in the historical centre is limited to just an hour. There is, however, free parking at the port, which is only a 5-minute walk from the apartment. Please note that Scale Nove is on the first floor, up a flight of steps. A second flight of steps leads from the apartment to the roof terrace. In August Gallipoli becomes vibrantly busy - not for those looking for peace and seclusion. In the other months, especially from September to June, the town has a gentle, laid-back atmosphere. Scale Nove is bang in the centre of lovely old Gallipoli, a historic fortified island town featuring some fabulous architecture, a great fish market, its very own sandy beach and a good choice of excellent restaurants. The delightful baroque town of Lecce is just 40 minutes' away, most certainly worth a visit, while the coastline, both north and south of Gallipoli is blessed with some of Italy's loveliest sandy beaches and azure waters. Shops, Market, Bars, Restaurant: right outside! "Scale Nove was beautiful and everything was very high end. We especially appreciated the excellent air-con during Lucifer!" Scale Nove was perfect. It was spacious for a family and located in the heart of the old town of Gallipoli. We had the most enjoyable holiday and would recommend The Thinking Traveller to everyone. We love Scale Nove and the roof terrace is wonderful. Scale Nove was beautiful and everything was very high end. We especially appreciated the excellent air-con during Lucifer! Scale Nove exceeded our expectations in style and location. The roof terrace is a fantastic feature with wonderful views of the sea and stars. The whole experience from staying at Scale Nove, swimming in the sea opposite the villa, wandering around the old town and dining at the local restaurants was everything a holiday should be and more. We really enjoyed the roof garden in such good weather with such good views... so restful and invigorating! I loved the peacefulness of Scale Nove, its setting on the edge of a historical city on the sea and the convenience of being in the midst of everything. Lovely property. We loved the décor and style of Scale Nove and loved sitting in the evening on the roof terrace. The maid was excellent and good value. It made such a difference having this option. The apartment was fantastic. We had a fantastic week. Lovely welcome supper when we arrived. Scale Nove is a beautiful elegant apartment. Our experience was absolutely wonderful. We enjoyed our time at the villa. We had a truly unique and exceptional vacation at Scale Nove! We all liked the contrast between the outside location; part of a historical characterful row of houses and yet inside it was very modern and sophisticated. Whoever did the renovation did a great job. We also liked the glimpses of the sea from different points in the house and the roof terrace was super. What we enjoyed most about our holiday? The accommodations and particularly terrace and views. The staff were courteous and very helpful and the in-villa cook was a plus. The villa was perfect for three people who each wanted their own bedroom/bathroom - lots of space so we weren't tripping over each other. We all really enjoyed the sunshine and views from the roof terrace of the villa. It was a great place to enjoy coffees in the morning. The relaxed atmosphere was the best part. We enjoyed good food and wine and it was nice to be staying in the old town of Gallipoli which has a somewhat intimate feel. It exceeded our expectations. Everything was just as it was portrayed in the brochure. No bait and switch here. The villa was of exceptional quality and was beautifully clean... beautifully situated amidst the old town with wonderful views from the enormous roof terrace, while out of the front door of the property takes you into old school Italy, a wondrous combination. Gallipolli is a delight, while the town beach is lovely and not too busy. For those not wishing with the bother of driving and parking the venue is perfect. It's so much easier dealing with Thinking Traveller than trying to negotiate, pay and deal direct with an owner. Scale Nove is absolutely stunning and in immaculate condition, with anything you could possibly need to make your stay easy and feel at home. The surrounding area was fantastic! Great nightlife for young people and lots of bars and restaurants within walking distance. As well as the beach right on the doorstep. However if you want to have a relaxing chilled out time, there is absolutely no reason why you even need to ever leave the apartment! From the fantastic, ginormous roof terrace to either sunbathe on and keep cool with the outdoor shower or to entertain guests with the barbecue and dining table (amazing entertaining area) .... You are really spoilt for choice of where to spend your days in this apartment... An absolutely amazing holiday! Will definitely be back! Scale Nove combines the character and high ceilings of an old building with the style and elegance of contemporary modern design at its best. The views from the apartment are spectacular... We loved being in the historic centre of Gallipoli with all amenities on our doorstep. We could swim right opposite the apartment and I could watch my (teenage and older!) children swimming from the kitchen window. Scale Nove is a stunning apartment, in a fabulous location - we absolutely loved it! Einfach wunderschön! Wir haben uns sehr, sehr wohl gefühlt! Das war einer unserer schönsten Urlaube bisher. Unterkunft, Ort, Essen, Atmosphäre Wetter...alles war einfach perfekt!